Unusually our orchid of the day is a species flowering in flask. This is Psygmorchis pusilla (previously called Oncidium pusilla) which is a large flowered miniature twig epiphyte from Central America. The plant here is 3cm high with a 2cm bright yellow flower. This is a species we have seen growing in Guatemala and Belize in hot dryish lowland forest on thin branches and twigs. 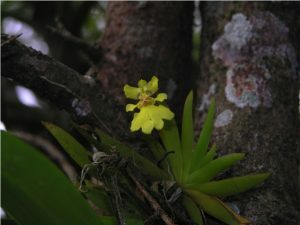 The photo below was taken in Guatemala where the plant was growing and flowering near Yaxha in the Mayan Biosphere Reserve. All the plants we have seen in the wild have been small and in cultivation we find the species short lived but profusely flowering on short spikes that produce lots of flowers successively. When we take plants out of flask we find that they do best mounted as they seem to resent compost around their roots. The natural habitat is most like out Warm Americas section with minimum 15C and bright light. 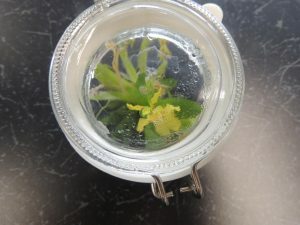 Flowering this species in flask shows how all a plants needs are met by the growing media we provide them in the laboratory. 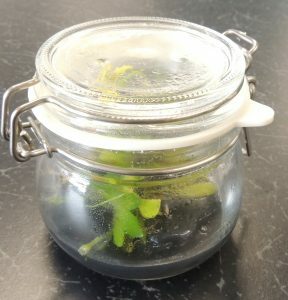 We are looking forward to teaching more people our laboratory techniques both next week at open evening and at the British orchid Show in November.